Something harmful might be hiding in your pet's favorite snack! 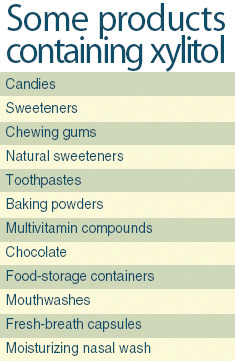 Xylitol, a sugar alcohol, is a white powder that looks and tastes very similar to sugar. While it can be found naturally in corn, oats, plums, berries, lettuce, mushrooms, trees, and hardwood trees and fruits, xylitol is commercially extracted from corn fiber, birch trees, hardwood trees, and other vegetable material. Being just as sweet at sucrose yet containing only two-thirds of it's calories, xylitol is becoming an increasingly popular sugar substitute over the past few years. While it may be safe for human consumption, the exact opposite is true for those non-primate species like your four-legged friend at home. If eaten, the xylitol would quickly absorb into your dog's bloodstream, resulting in a rapid release of insulin from the pancreas and causing a life-threatening decrease in blood sugar. In the most severe cases, a dog can develop seizures and even suffer liver failure. Symptoms of xylitol poisoning begin rapidly developing about 15-30 minutes after consumption; weakness, vomiting, depression or lethargy, tremors, difficulty walking or standing, seizures, and coma are all signs of hypoglycemia. The biggest downside, however, is that there is no antidote for xylitol poisoning for your dog... so you have to be sure to keep an eye out to avoid the problem all together! Sugar-free gum is one of the main snacks posing the biggest threat to your pooch. With certain brands, only 9 pieces of gum can result in severe hypoglycemia in a 45-pound dog, while ingesting 45 pieces would cause liver failure. If you are using any products that contain xylitol, make sure that you are aware of storing it far out of your pets reach. Be sure you also check for xylitol listed in the ingredients as well as the sugar alcohol content listed in the Nutritional Content of your foods! Peanut butter is surely a main pet and owner snack favorite, but there are brands of peanut butter that are harmful to your pet! Numerous nut butter brands are using xylitol in their products, hiding a potentially serious problem for your pet. Some of these brands include Go Nuts, Krush Nutrition, Nuts 'N More, Co, P28 Foods, and Protein Plus PB. Unfortunately, sometimes a persistent pooch will get his hands on the forbidden snack no matter what precaution you take. If you catch your dog chowing down on the sugar-free gum from your purse, take him to the vet who may induce vomiting to inhibit further absorption of the toxin. However if clinical symptoms have begun to develop, your vet will provide treatment based on the symptoms shown. In all cases, your dog will require hospitalization in order to monitor blood sugar, administer dextrose, intravenous fluids and liver protectants, as well as provide any needed supportive care. With all of this being said, it is so much easier to prevent the problem all together! Try and take extra caution stowing away those sugar-free snacks so you and your pet can enjoy a happy and healthy home for as long as possible!